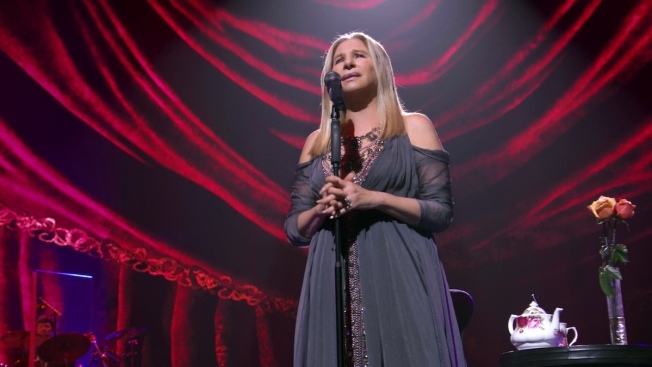 This image released by Netflix shows Barbra Streisand in a scene from her concert special, “Barbra: The Music ... The Mem'ries ... The Magic!” debuting Wednesday on Netflix. In an interview with The Associated Press, Streisand, 75, talks about her new concert film, her dog (who died this year) and the multiple sexual assault allegations against powerful men in Hollywood and politics. If you want to see Barbra Streisand sing, watch her upcoming Netflix special because you won't see her onstage again. And she's not just saying it to get you to watch "Barbra: The Music ... The Mem'ries ... The Magic!" when it debuts on the streaming service this Wednesday: Streisand, who didn't tour for 27 years after forgetting the words at a show in 1967, said performing live concerts are too nerve-racking for her to consider doing them again. "No I would never do another show. It's exhausting," the iconic entertainer said. "I'm not ever going to sit down and plan another show like I had to do with this one," she said of the new special, recorded during her tour stop in Miami last year. Of course, Streisand has said farewell before only to come back. She says this time she means it, but also adds: "I never say never." The performer also explained that she prefers recording music in a studio and filming movies: "It's a private thing. I don't care how I look ... I'm not being judged at the moment." In an interview with The Associated Press, Streisand, 75, talks about her new concert film, her dog (who died this year) and the multiple sexual assault allegations against powerful men in Hollywood and politics. AP: So you really won't do another tour? Streisand: No. No. I know. I can't. It's just too vulnerable. It's too hard for me. I wish I loved it. There are so many performers who perform practically the whole year, you know, 200 or 300 days a year. They love it. And I wish I felt that way. It would be great because it's very lucrative but I can't do it. It's just too hard. I think about what I eat after the show. You know, I plan the meals after the show so I could be free of anxiety. I actually did this last tour for a painting. There was a painting I wanted and it was expensive. I'm a big fan of (Amedeo) Modigliani. There was a painting I wanted that I really had a save up for it. ... I lent it to the Tate Museum in London. I can't work for money. I have to work for an object that I love, something I want to live with. ...What does money do? It goes somewhere, a stock, a bond. I don't see it. But a painting I can look at every day and enjoy. AP: When you Netflix and chill, what do you like to watch? Streisand: (Laughs) That's a funny question. I love things like "The Crown." I love that. And the fact is my husband (James Brolin) and I are kind of binge watchers. I remember when we first got "Homeland" or something, somehow I got a hold of like eight of the shows — my God, we just watched those till the morning. It's hard to wait for a week. So we love it. AP:You've worked in Hollywood for a long time. Do you think there's less tolerance for sexual assault in the business since people are being called out and there have been serious consequences? Streisand: Yeah. You can understand. I mean, right before I took your call I'm watching MSNBC and a woman is talking about another assault victim of Roy Moore. ... Women were frightened. What do you say? What do you say to a man that's touching you inappropriately? Or (the women are) afraid to lose their jobs or whatever. It's a conundrum, you know. And now they have the support of other women so they're speaking out. Complimenting you should be allowed. It's the touching or it's the constant, probably, assaulting, you know, not giving up on someone ... I'm for the truth, put it that way. I believe in truth being, it's the essence of living in a democracy, you know. As the Dali Lama said, "There's truth with compassion." I've had to learn that, too. But these are these are difficult times. You know what worries me about what children are hearing, what our next generation is hearing and seeing, you know, what upsets me these days is, "Are they seeing that it's OK to lie, or to brag about sexual assault? That's just locker room talk." Is it right to see the head of the government in the sense never apologizing or retaliating? Is it OK to try to silence people in the press when they don't agree with you? To lack kindness and humility? It's not so right. AP: How are you doing since your dog, who appears in the film, died this year? Streisand: She was always with me; the last 14 years she went everywhere I went. She was at every performance. It was like losing a child. It was kind of awful.